We're a curious bunch here, in that we like to know about things (though some would argue the term could be applied equally aptly for other reasons)! Our chookies laid three eggs on their first full day with us - and another three the day after. It seemed that one girl was slacking, so Vaughan and I weighed those six eggs to see if there was a pattern in terms of size and weight. We thought there were some similarities but Nick wasn't convinced of our "proof"! The girls gifted us four eggs on Good Friday (now eaten) and another four on Easter Monday. 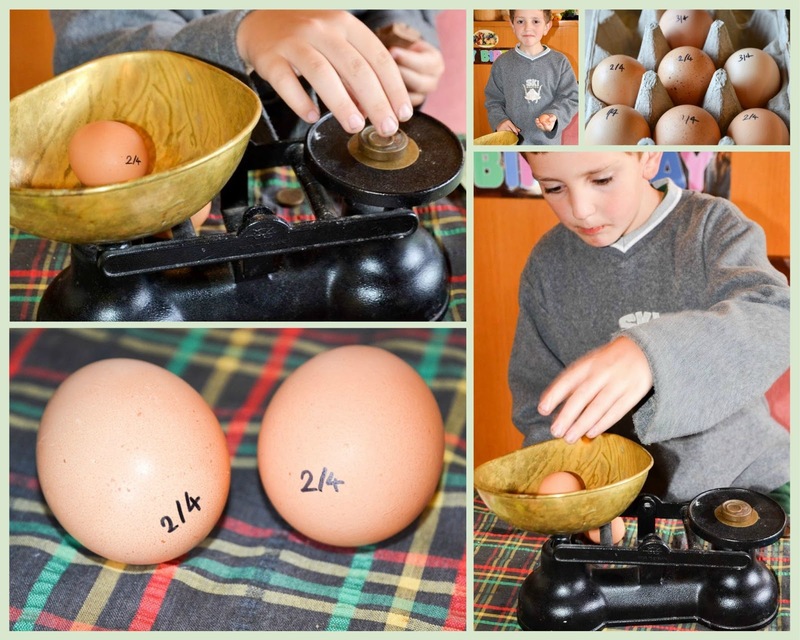 Vaughan is already recording the number of eggs received each day and this week we'll attempt to record all the weights also. So far the weight range is from 55 to 65 grams, though on their first day one of the girls laid an egg that was a little over 70 grams. (Something I read recently stated that as chooks aged, they laid larger eggs). It's hard work weighing eggs, Vaughan had a huge chunk of chocolate to sustain him during the process - and needed to stuff it into his mouth so both hands were free!